Megaphone rental is a power horn speaker capable of projecting your voice in superb clarity — up to one mile! It’s perfect when you need to be heard indoors or outdoors in front of a large crowd. Get your voice to the right level with the variable volume control. The built-in siren will get everyone’s attention! You can even plug in an external audio device, like an iPod or iPhone, using the 3.5mm jack. 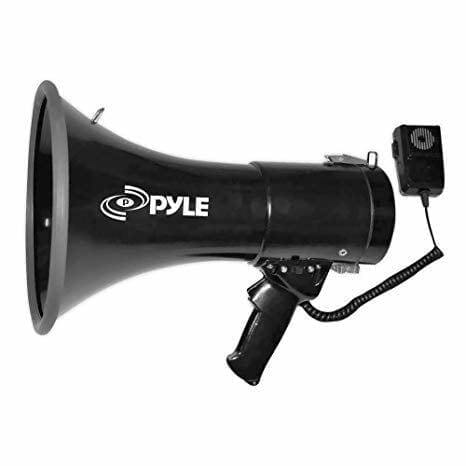 Pyle’s megaphones feature a tough housing and goes with everything as it is all black. Join the growing number of groups using this brand megaphone including: the U.S. Army, schools, sports coaches, and more. Requires 8 C batteries (included with rental). **Notes: batteries provided, but we are not responsible for batteries.